Maximo Laura: Eternal Vision was exhibited from the 21st of July through the 27th of August, 2017 at the Toi Gallery, Pātaka Art + Museum, Porirua City, New Zealand. With New Zealand being an island nation, Maximo felt that this exhibition would relate well to our country. Maximo Laura: Eternal Vision is an exhibition about the sea and the colours of sea life. The collection is an impressive display of brilliant colour transmitting an overpowering sense of awe. This is the work of a Master who knows how to use colour and design to bring together a world of beauty and life beneath the sea. Maximo Laura, “Happy Sunset II,” 48 in x 48 in, 12 epi, 2017, photo: Giovanna Beariz Rodriguez M. (Prin) , Cotton warp, mixed weft. 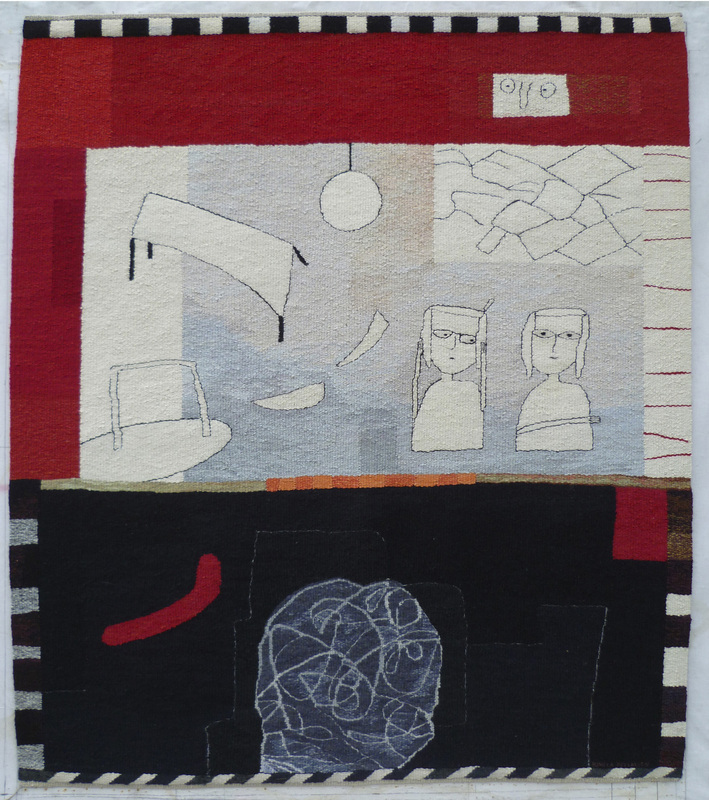 Maximo Laura, “Alabanza a la Fertilidad,” 47.5 x 76.5, 12 epi, 2017, photo: Giovanna Beariz Rodriguez M. (Prin), Cotton warp, mixed weft. The viewer observes seaweed, molluscs and fish blending together – one fish inside another, their eyes always seeing – waves, serpents, jelly fish, shells, sea horses and sharks – the colours and shapes of the sea are so imaginatively put together. Crabs, flying sting rays, dolphins, whales – under and above the water. Sea life from shallow water to the murky depths – observe the colours changing. The shapes intertwine – straight lines, curves and from some of those shapes, tendrils of twisted yarns extend to show the plant life and anemones. Maximo Laura, “Fruto de Abundancia del Mar II,” detail, 12 epi, 2017, photo: Giovanna Beariz Rodriguez M. (Prin), Cotton warp, mixed weft. 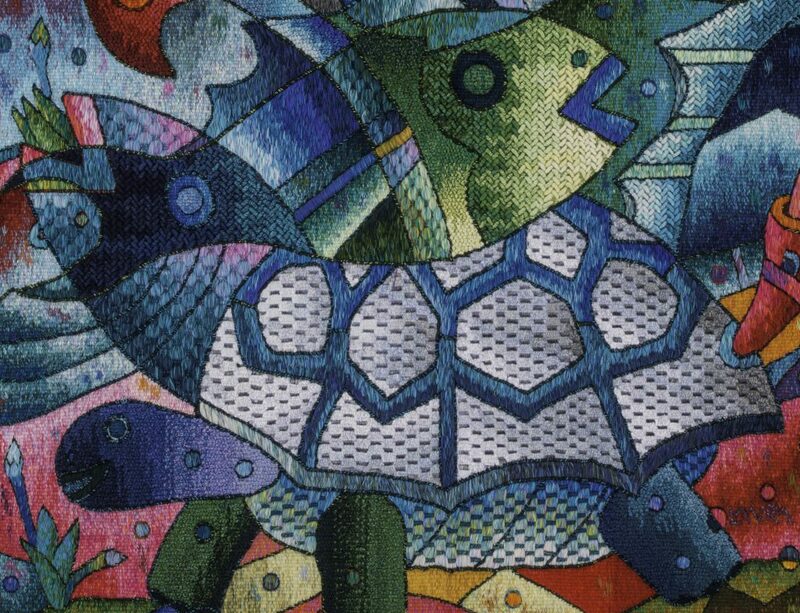 The tortoise of the Galapagos takes centre stage in one of the tapestries, a double weave structure being used for his shell. The effect of new techniques together with the colour is WOW! The use of a super-twisted yarn woven as a supplementary weft in a chevron pattern in the fish is similar to other wrapping effects, but it is fine and gives the amazing effect of fish scales, the colour shimmering. 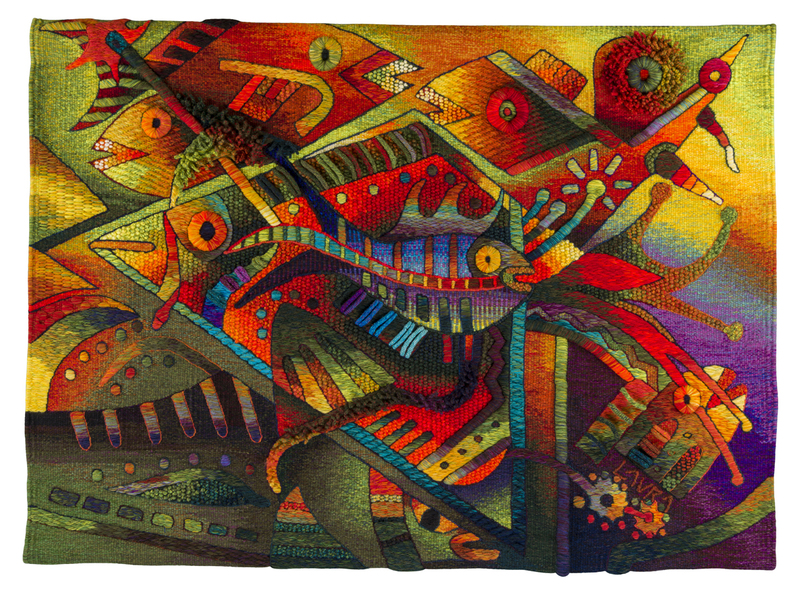 The tapestries are an exploration of new techniques for Maximo. 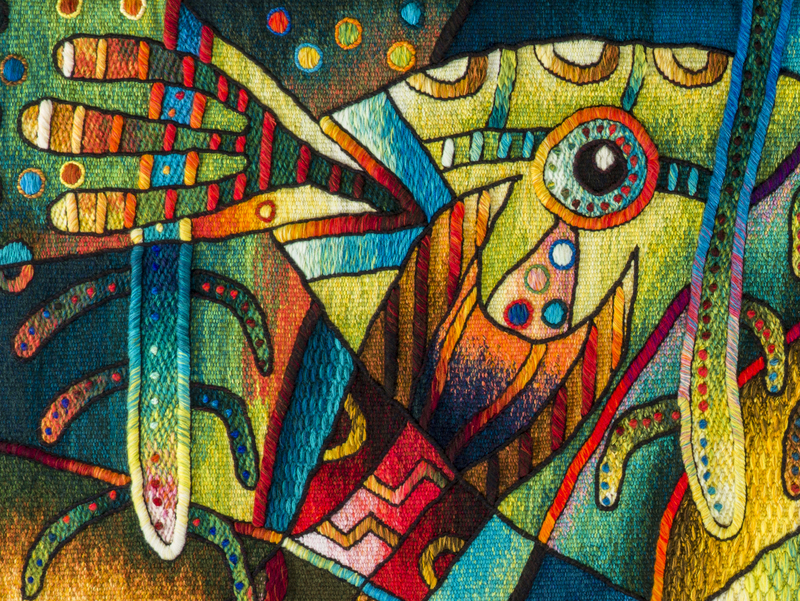 The viewer is drawn into the tapestries through the colour and texture. The weaver asks, “How did he do that?” Or, “Look how those contrasts work so well.” The tapestry is rich with the depth of the double weave technique, the overlap of the supplementary wefts and warps, the herringbone effect using a supplementary twisted weft and the deep colours beneath a contrasting top weave. Maximo Laura, “Encuentro en la Playa Del Amor II,” detail, 12 epi, 2017, photo: Giovanna Beariz Rodriguez M. (Prin), Cotton warp, mixed weft. Maximo’s use of outline is important. This is how the whole work is pulled together. 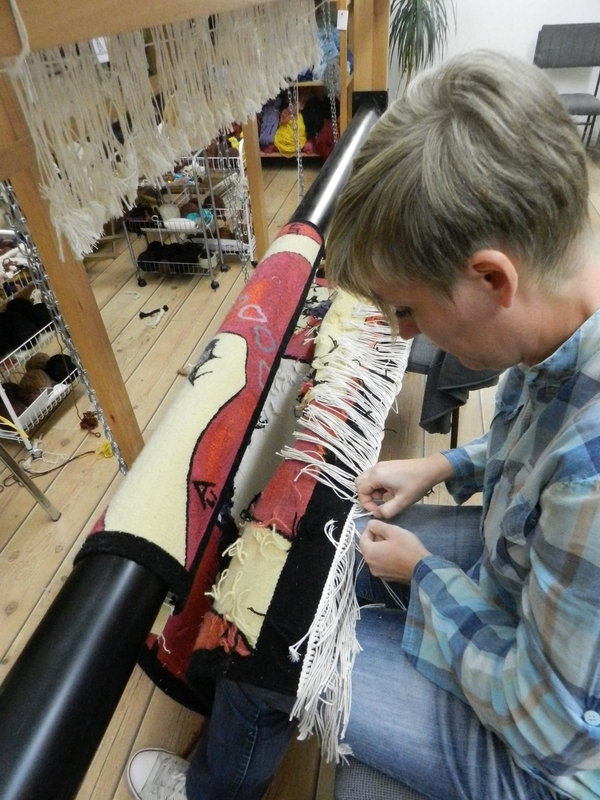 Because the tapestries are woven on a two shaft floor loom, only about 20 cm of warp is exposed at one time. The tapestries are woven row by row, not in the usual tapestry form of building blocks. Some of the threads work in opposite directions, some in the same direction, depending on the technique. But in each row a surface binding thread of a contrasting colour joins one block to another. The result is a sound weave. No slits need to be sewn. Maximo emphasizes variation in weave structures by using skips of weft threads, twisted yarns that provide an impact of texture and colour, variations of soumak and twills, and blocks of texture broken up by plain weave. 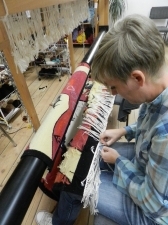 The use of a double warp extends the possibilities so as to make double cloth viable – interchange between layers, supplementary warps for wrappings, supplementary wefts for some amazing seemingly complicated techniques. Maximo Laura, “Encuentro Marino,” 34.5 in x 53 in, 12 epi, 2017, photo: Giovanna Beariz Rodriguez M. (Prin), Cotton warp, mixed weft. Maximo Laura, “Encuentro Marino”, detail, 12 epi, 2017, photo: Giovanna Beariz Rodriguez M. (Prin), Cotton warp, mixed weft. But it’s not just about the techniques – it is also definitely about colour. 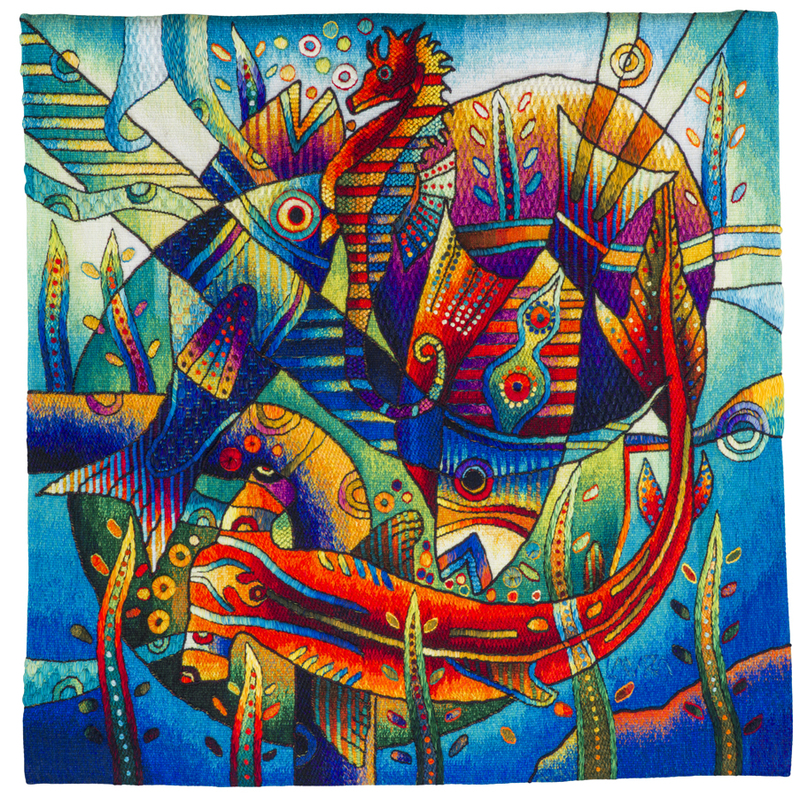 No solid colours are ever used in Maximo’s tapestries. Each colour is made up of a blend of different shades of the same colour, quite often held together by only one or two contrasting threads, or a blend of a mix of different colours making a combination of colours which sing – they never turn to ‘mud’. The way the mixes of yarns jump from one bold colour to another – quite often with just one or two threads as the link. The key is that there are up to 12 yarns in one butterfly. There are sharp contrasts of colours which enable them to blend into each other within a very small space. 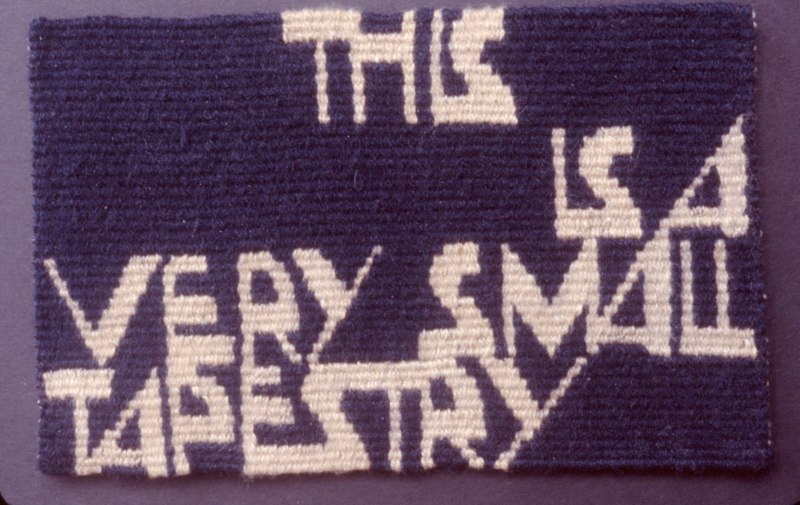 Viewers of the tapestries become confused by the way the works are created and ask – “How can these works be woven? They look like embroidery techniques.” People who are unfamiliar with Maximo’s weaving process or the weaving process in general, ask, “Do you stitch on to canvas? 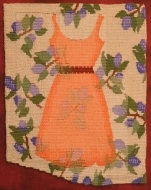 Do you stitch surface embellishments once the weaving of the background is completed?” All of the techniques are woven on the loom – there is no top stitching. 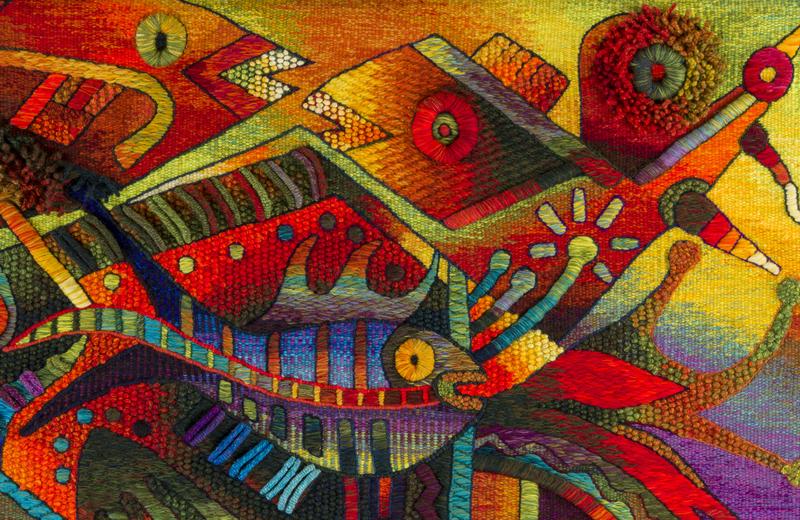 Maximo has been asked whether the colours and weave structures used in his tapestries are traditional in his country. 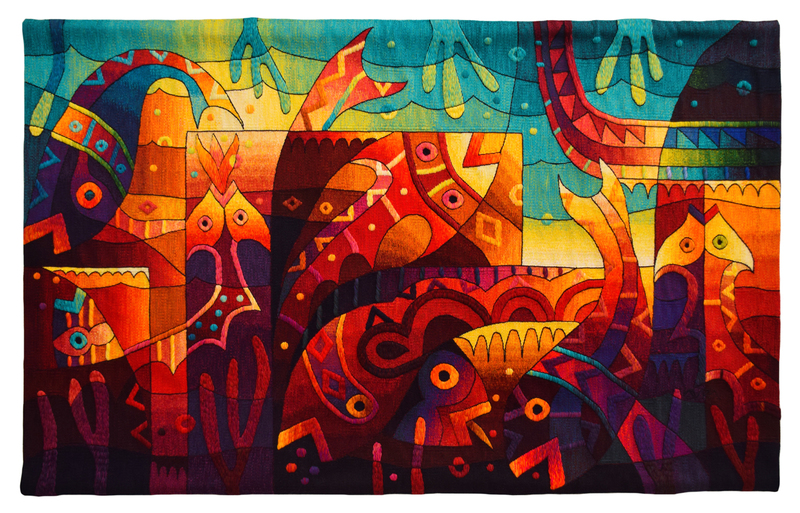 The answer: This is definitely not traditional Peruvian weaving, though the stories behind many of Maximo’s tapestries are from Peruvian folklore. Throughout this exhibition, the viewer travels from the sky into the water, from the surface and waves to the reef life and then on to the depths of the ocean. 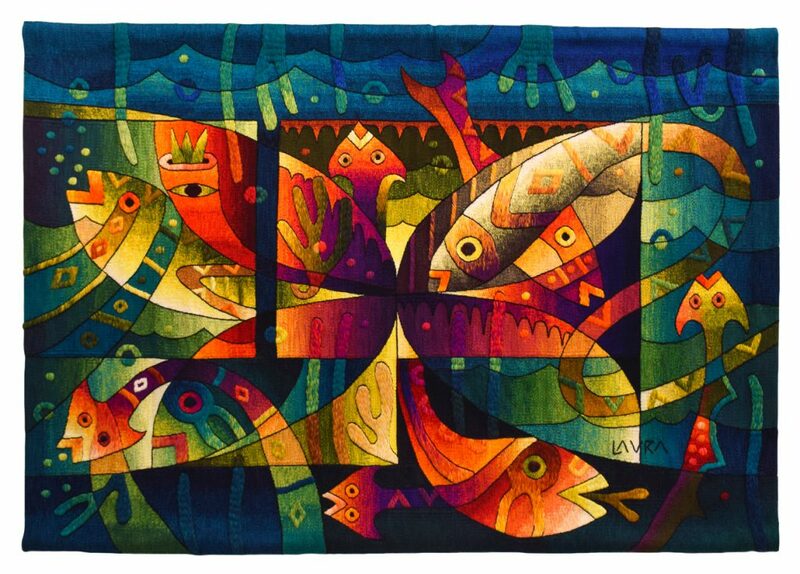 Every part of the sea is represented in this kaleidoscope of colour, texture and design. 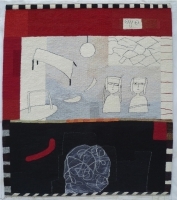 Maximo Laura, “Vitalidad Marina,” 47.5 in x 69 in, 12 epi, 2017, photo: Giovanna Beariz Rodriguez M. (Prin), Cotton warp, mixed weft. Patricia Armour is a tapestry artist who lives and works in Wellington, New Zealand. 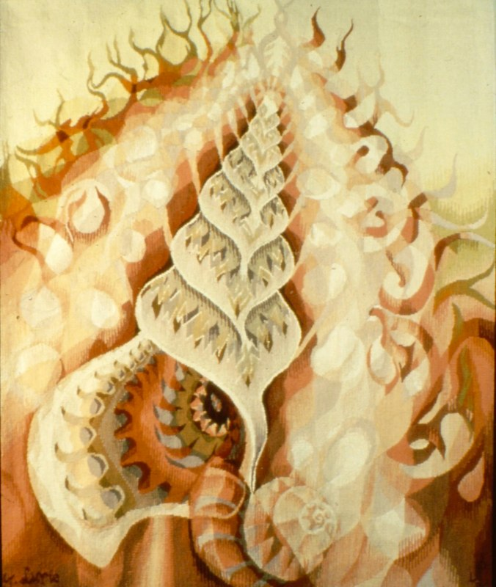 She exhibits regularly in New Zealand and has held two solo shows in Wellington. Patricia’s tapestries reside in private collections in New Zealand, USA, United Kingdom and Japan.